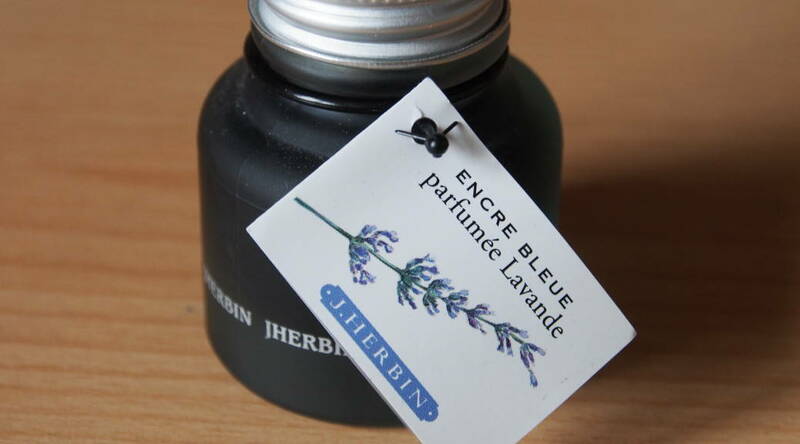 I bought the ink originally for its novelty value (and because I like the smell of Lavender). However, on receiving I found the smell to be reminiscent of Lavender but not wholly convincing, certainly when compared to the Lavender essential oils I have bought in the past. So I didn’t ink a pen up with it. At the time I bought it, it cost £6.95 for 30ml, although it has gone up to £7.95 with the same supplier in the intervening period. The bottle is classy but functional. 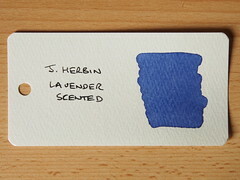 The small tag gives a brief general description of scented inks. 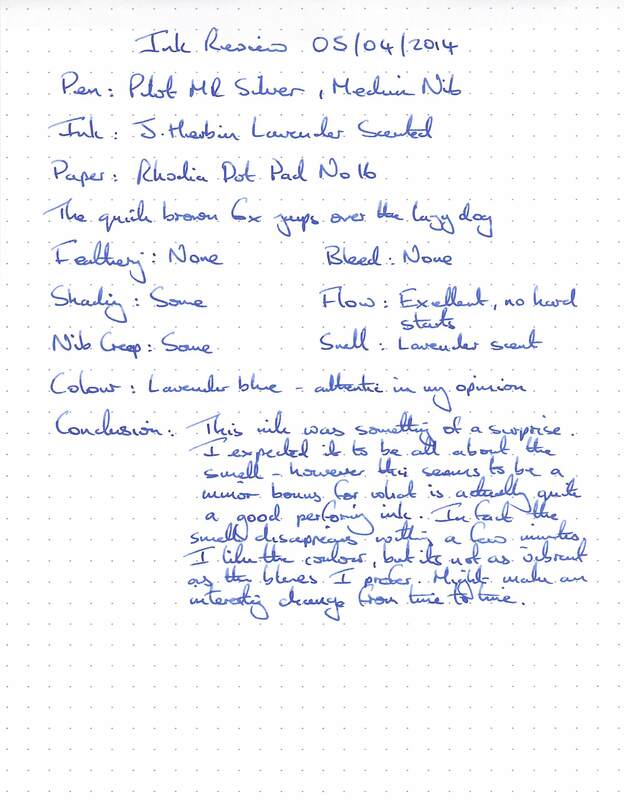 For this and future reviews, I will no longer include water resistance, drying times and cleaning in the Rhodia Dot Pad entry, because I am actually testing these separately. I test water resistance using two small sheets of Rhodia, one under running water for 10 seconds, the other with drops from a syringe simulating rain. 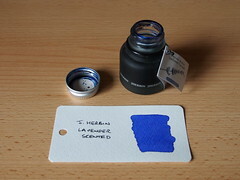 This ink showed no water resistance, leaving only a faint trace under running water, and was illegible from the water drops. I am finding ease of cleaning to be a challenge to assess. 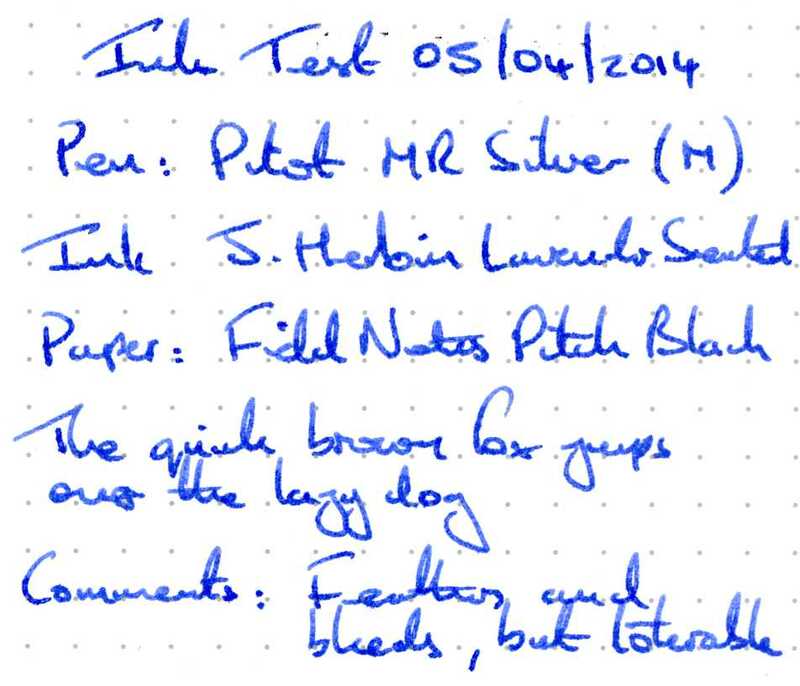 For ink reviews I like to leave the test pen inked for a few days so I can assess dry starts, and then clean out the pen after the writing test. However, I’ve found that certain inks only really show how difficult they are to clean out after a few weeks. I didn’t experience any problems with this ink, but if I do in future I will add a comment to that effect later. 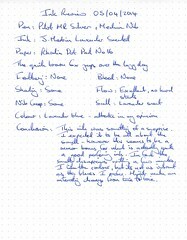 In all respects the writing experience was good and I didn’t experience any dry starts, even on Rhodia. The fragrance disappeared after a few minutes. Again the writing experience was good, smooth with no feathering. The ink didn’t flow well over the coating on the paper (not sure if this actually is adhesive or something to stop the Post-Its sticking together too much). It was still usable though. Actually better than the other inks I have tried so far. Still feathering but less bleed through. The scan makes the ink look more saturated than in reality. Still not a viable candidate overall. 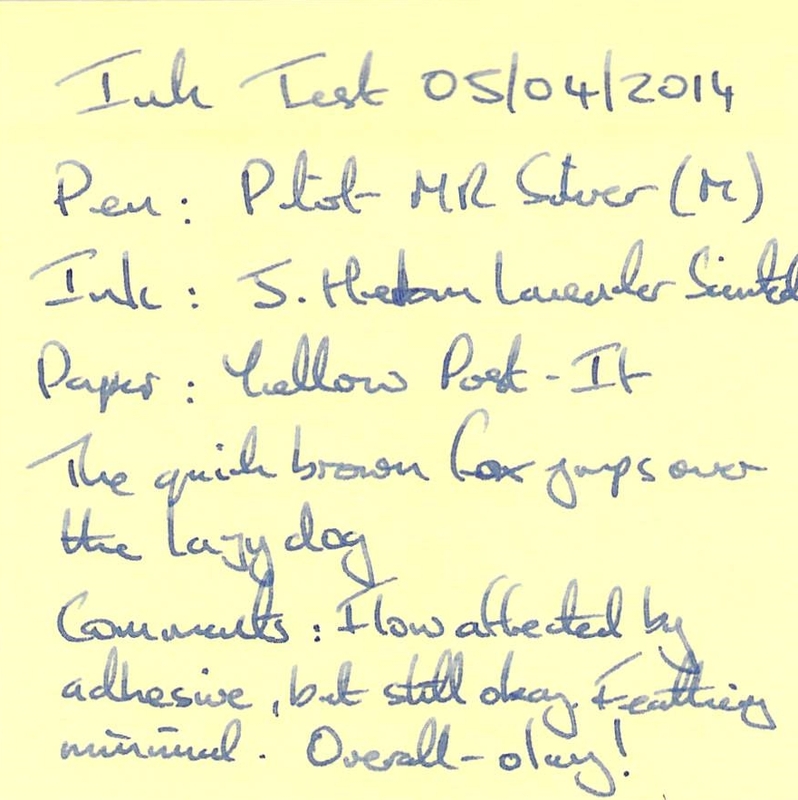 This swab shows much less shading than, for example, the Rhodia handwriting test, which is surprising. 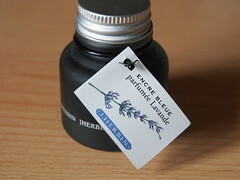 The Lavender scent persisted for longer (no great surprise as more ink was applied) but was gone the next day. The scan also shows a more vivid blue than in real life – I think colour correction is interfering again. I was pleasantly surprised by this ink. It performed well, although the lack of water resistance could be a problem to some. I may still try it in rotation, but am unlikely to buy it again if I do get to use it all. The novelty of the Lavender scent to me doesn’t offset the extra cost, especially when it doesn’t really smell authentic to me, and there is the large number of other good blue inks on the market. Will I try another from the same range? The swabs I’ve seen of the Rose suggest I wouldn’t like the colour, while I don’t especially like the smell of Violets so I will pass on that one. 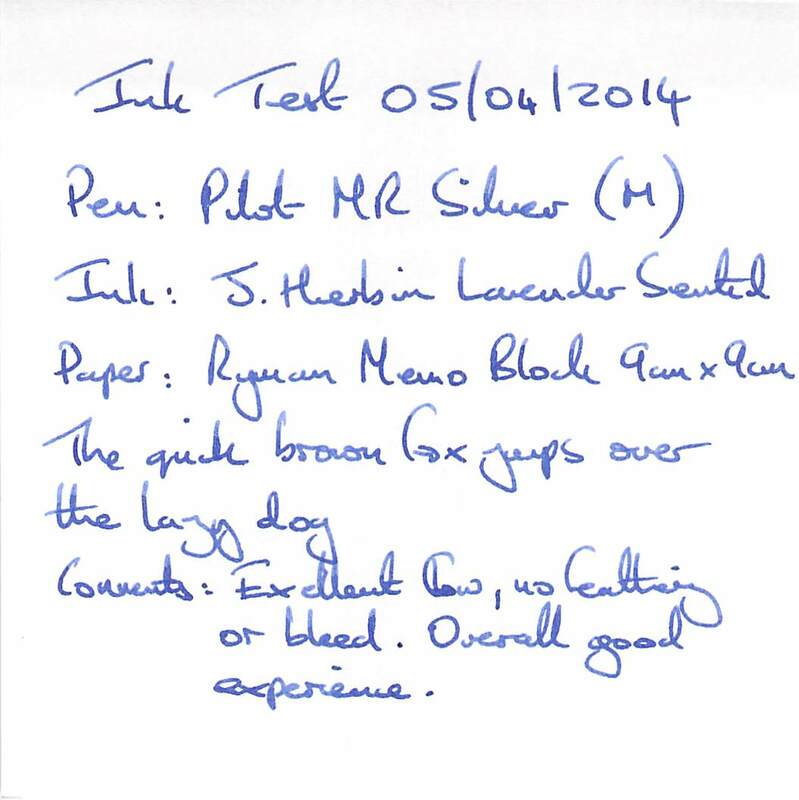 I was tempted by the Apple scented ink, but again the swabs I have seen make the colour look far too pale for me. The Orange scented ink therefore seems the strongest possibility. 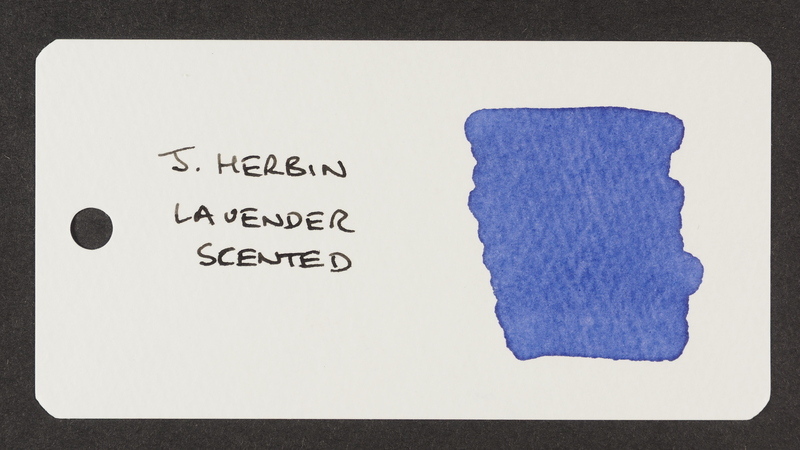 The colour looks interesting, and in the comments in the Inkcyclopedia review it was suggested it smelt of Neroli (orange blossom) rather than oranges. I just need to decide if I need yet another orange ink, as I already have quite a few.